Let's face reality: in indy feature films there's practically no reason to use timecode. There just isn't. You can't really sync any sub-$100,000 camera with timecode on set, and so you can't really use it in post. 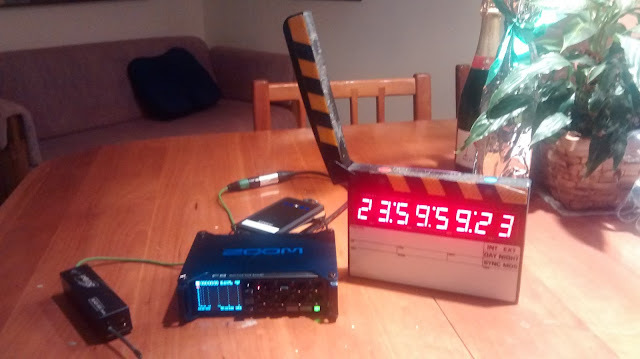 But because I was a sound mixer in a previous life, I have a fancy-pants timecode slate made by Ambient. Thing is, I've never fed it timecode. Originally I had one of those Fostex PD-2 DAT machines. That was a clunky thing. Expensive. Fiddly. But it could read and write timecode in whatever format you wanted, do pull-up and pull-down and whatever nonsense people used to do when shooting at 24fps, blah-blah-blah. The slate here is twice as expensive as the 8-channel recorder. What you see here is the transmitter to the slate, a battery (top) and the Zoom F-8 (in stop so it's not transmitting TC), and an Ambient slate. I found that as a production sound guy, producers loved the numbers going around and around on the timecode slate. They never used that timecode and pretty much nobody on set knows what they're going to do with anything you deliver anyway, but that's just how it is. 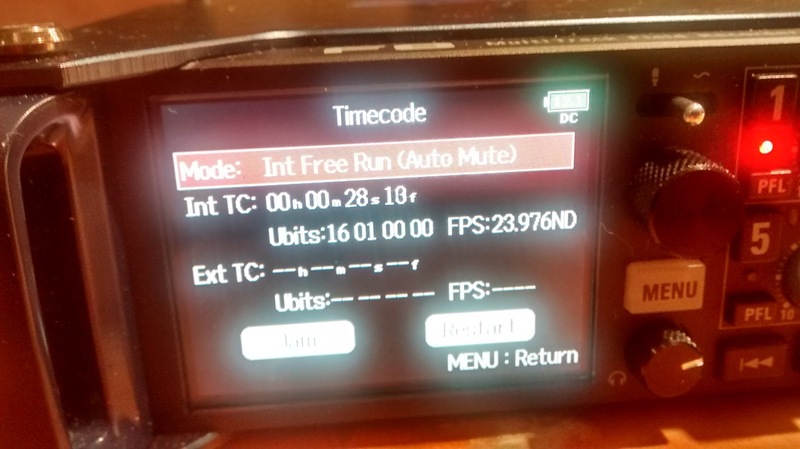 The timecode menu on the Zoom. Note that you can set the "user bits" to be almost anything you like. Here I'm experimenting with having it display the number code for a movie called "1601". The "auto mute" means that it only puts out timecode when the recorder is running, so the slate will only display moving timecode when you're in record. So now that I have timecode available again, even though we'll never use it, I'm still going to make sure the slate receives it. Why? Who knows? It's completely irrational of me. But we can do it, so we're going to. It's ten minutes of 8pm. 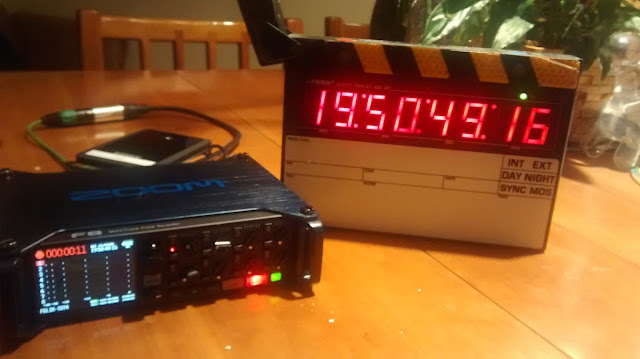 You can see the record light is on and the Zoom is recording, therefore it is outputting timecode. When the slate is clapped, the user-bits will show up for a second or two but that is just about impossible to photograph with a still camera. Heh heh. You said user bits.